A reading from the gospel of John 20:1-18. Listen for God’s word to us. What does resurrection have to do with our lives – not just some day off in the future when our mortal flesh returns to the earth. But today, on Easter. And tomorrow. And the next. And any random day of the week, like three weeks from next Tuesday? How does resurrection impact us every day? We know how it impacted the life of Jesus, the Christ. Arrested for sedition by a state that was colluding with religious folks who believed him blasphemous, Jesus was brutally executed. Hung on a cross as were all those in his day who were condemned to die. A handful of women – and, according to the gospel of John, the beloved male disciple – were the only ones from the throngs devoted enough to watch. Joseph of Arimathea – who represented a dissenting voice on the Jewish high council – and Nicodemus – the Pharisee who once went to Jesus at night to learn of God’s undying love for the world – got his body off the cross. The gospel of John records that they wrapped him with about a hundred pounds of myrrh and aloes – which is a hole lot of powerful healing oils! They placed their dead Rabbi in the linen cloths, according to the burial custom of the Jews. And because the Jewish day of preparation was fast-approaching, they laid his body in a newly hewn tomb in the garden near the spot where he had been crucified. Night fell as the corpse lay stone-cold still, the ruah – the breath of Life, the spirit of the one called Jesus no longer there to animate his body. Resurrection meant all the difference for that one! Early on the first day of the week, after the celebration of Passover was over, in the dark before dawn; Mary Magdalene found her way back to the tomb in the garden. Love’s redeeming work was done! He was not there but had risen! That very morning, he again called her by name. Standing before her face-to-face; the Risen One charged her to go tell his brothers. He was ascending – returning to the Source from which he had come. Though he would appear to them all later that night. Then one week following. And again, when they had returned to the boats and nets. The power of his life was not yet done. The resurrection of his body confirmed all he had been teaching – the LORD of heaven and earth would have the last word, not death. But Life for all and forever for those who would follow his path. Resurrection changed the lives of those first rushing to the tomb. Mary Magdalene, Peter, and John. Mary his Mother, James his brother, Thomas and all the rest too. To the ends of the earth eventually they would go. Not scattered like scared sheep but sent with purpose to the far-reach of lands we now know as India, Africa, and Europe. From that one little spot in a garden outside the walls of Jerusalem, a different kind of world-wide web would form. The message over and over: “I have seen the Lord! The crucified, dead, and buried; lives forevermore!” He is present with us. In us, as we continue to walk the path he taught throughout his living and dying and living again. . . . Talk about an adventure! All around their known-world they went to teach any who would listen everything they had seen and heard. To give witness to Christ’s healing power. To tell of his up-side-down understanding of the welcome of God. To live in ways that showed yet the life-transforming effects of compassionate love. Resurrection made all the difference in a world craving any seed of hope. Resurrection is meant to change our lives too. It shows us the pattern imprinted by the Creator in the creation. Life. Death. Life again! We too live forevermore. Our days have purpose because of what we have seen – not just far off in the land where Jesus first lived. Not even alone in the stories of scripture that we cherish. But also in our very own lives. Where the power of forgiveness has broken-open our hearts to heal. To begin again. Where the up-side-down welcome of God has allowed us to be – to accept ourselves in all of our foibles, because each part is accepted by God, redeemed by God, cherished not as weakness but as an opportunity for God to work wonders we cannot accomplish on our own. In our own lives – I hope we have experienced and continue to be for others – people of compassionate love; those who consider the need in ourselves even as we notice the deep need in another. Resurrection is meant to change our lives – to give us hope in a world where we’re taught to focus more on that which divides instead of seeing all the ways we are connected. For we need one another. 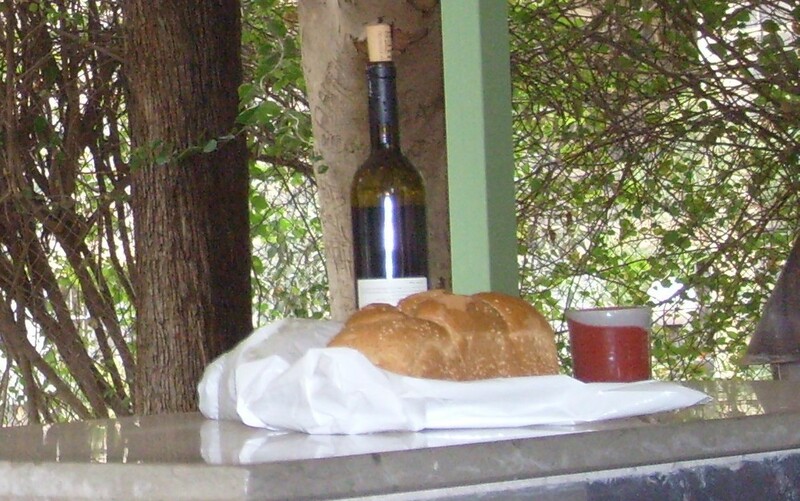 And when we sit together to break bread, the mysterious Spirit of God is found binding us all into one. Resurrection has everything to do with us – with our living, with our dying daily, with our living again now and forevermore! . . . Happy Easter, Resurrection people! When we depart from here, let us go to make all the difference! This entry was posted in Sermons and tagged 1 April 2018 sermon, Easter, Easter Sunday Sermon, John 20:1-18 sermon, Living as Easter People, Mary Magdalene, Resurrection, The Empty Tomb, The Pattern in Creation on April 3, 2018 by RevJule.